Nobel peace laureates gathered in summit in Paris on Friday 12th December to award Irish rocker-turned-activist Bono the annual “Man of Peace” prize for his struggle against poverty, disease and debt in Africa. Paul Hewson (born 10 May 1960 in Glasnevin, Dublin, Ireland), more commonly known by his stage name Bono, is the main vocalist of the Irish rock band U2. Bono was born and raised in Dublin, Ireland, and attended Mount Temple Comprehensive School where he met his future wife, Ali Hewson, and the future members of U2. Bono writes almost all U2 lyrics, often using political, social and religious themes. During their early years, Bono’s lyrics contributed to U2’s rebellious tone. As the band matured, his lyrics became inspired more by personal experiences with members of U2. Among his non-U2 endeavors, he has collaborated and recorded with numerous artists, sits on the board of Elevation Partners, and owns a hotel with fellow band member, The Edge. Bono is also widely known for his activism concerning Africa, for which he co-founded DATA. He has organized and played in several benefit concerts and has met with influential politicians. He is the co-founder of EDUN, the ONE Campaign and Product (RED). 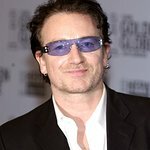 Bono has been nominated for the Nobel Peace Prize, was granted an honorary knighthood by Queen Elizabeth II of the United Kingdom, and was named as a Person of the Year by Time, among many other awards and nominations. In the presence of five Nobel Prize winners, Bono received his latest accolade from the hand of Paris Mayor Bertrand Delanoe, the host of this annual summit in recognition of two decades of global anti-poverty activism. “This is a very big award for me because, let’s be honest, this is as close as I am going to get – as close as a rock star is ever going to get – to the Nobel Peace Prize,” the 48-year-old Bono quipped to the audience. “I am an over-awarded, over-rewarded rock star. You are the people who do the real work,” he said to Nobel winners present, who included F.W. de Klerk of South Africa, Lech Walesa of Poland and Northern Ireland’s John Hume. Organizers said Bono was chosen for his global campaigning to persuade rich nations to lighten Africa’s debt burden, combat poverty, promote fair trade and raise funds for the treatment of HIV-AIDS and malaria. Last year’s recipients of the peace award were US actors George Clooney and Don Cheadle, who have spoken out against the violence in Sudan’s war-torn Darfur. Nobel winners were meeting in Paris for a three-day summit, coinciding with celebrations marking 60 years since the UN declaration of human rights was adopted in Paris.